Welcome to Odessa Castle's Teahouse! A loving but mostly irreverent guide to the anime that started it all. Ronin Warriors is the epic story of five dudes who save the world by dressing up like mystical hood ornaments and shouting a lot while the goddamn tiger does all the work. The original Japanese title is Yoroiden Samurai Troopers, and as an anime it's way classier than the English adaptation. 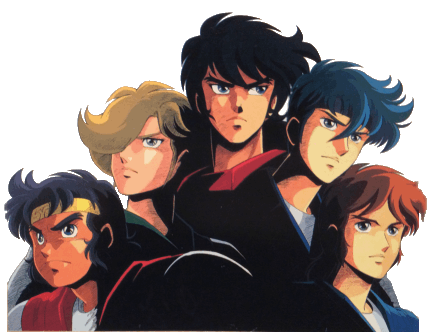 But Ronin Warriors is more fun, and for good or ill, it's how we met them, and each other. The story, such as it is. Official images, plus artbook and merchandise guide. Tenshi watched RW when it aired in '94, but only got into it for real in college. llamajoy's sister introduced her to the show in summer '98.